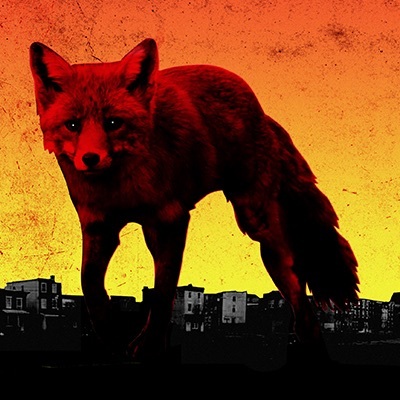 Album Review: The Prodigy, The Day Is My Enemy – music waffle. When I think of The Prodigy, my primary memory is a wedding reception some moons ago, where I happily jigged the night away to the track Charly. To my horror when I checked, this song was released a massive 24 years ago! Have they really been around that long? I’ve got a few more laughter lines since then, but The Prodigy retain an admirable level of energy and aggression that’s frankly a bit scary at times. This album is their first offering in six years, and you get the sense that they’ve been storing up some gripes for the occasion, and they let you have it with both barrels. They assume the persona of a nocturnal fox, sly, slinky and suspicious. A creature to be wary of. 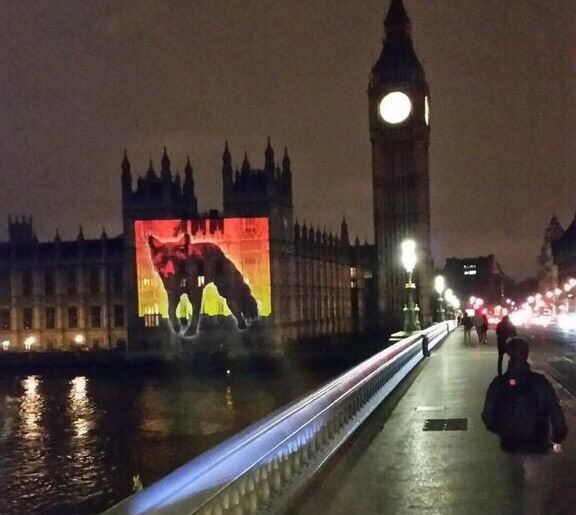 The image has been projected onto London landmarks to mark the launch of the album. The title track is a strong and searing opening with military booms and marching beats to accompany Cole Porter’s nocturnal All Through The Night lyrics, sung by Martina Topley Bird, “The day is my enemy, the night my friend.” And there follows a set of beat pounding, pile driven tracks, part dance, part rave up. As a rule I would struggle to listen to 15 tracks and 60 minutes worth of this kind of relentless stuff without feeling like I was being repeatedly punched in the temples, but there’s enough variation to keep me onside: The over rolled Rs of Rebel Radio, the whiny voice on Rok-Weiler, the school xylophone effect on Roadblox, a bit of the snake charmer in Medicine. I dare anyone not to have a bounce about to Get Your Fight On. There are shades of Pendulum and The Chemical Brothers, but it’s unmistakably The Prodigy. The Prodigy’s strength has never been their lyrics, but a couple of tracks do rather make me laugh (in an affectionate way). “Nasty nasty, triple X rated” is making it really clear that’s it’s absolutely and genuinely nasty. In Wall Of Death, “F*ck you and your heart attack!” is utterly charming. And in Ibiza, a collaboration with Sleaford Mods, we get “What’s he f*cking doing? What’s he f*cking doing? Blah!” And you can just picture a group of beery Brits abroad stumbling out of an Irish bar into the Mediterranean night, shouting along to this rant. This album is a tonic to so much of what is currently popular in music, which is, if we are honest *whispers* boring. Nice to see a grenade amongst the lot of it, to shake the charts up a bit and add a rainbow to the shades of grey. Previous Weekly Photo Challenge: Ephemeral.